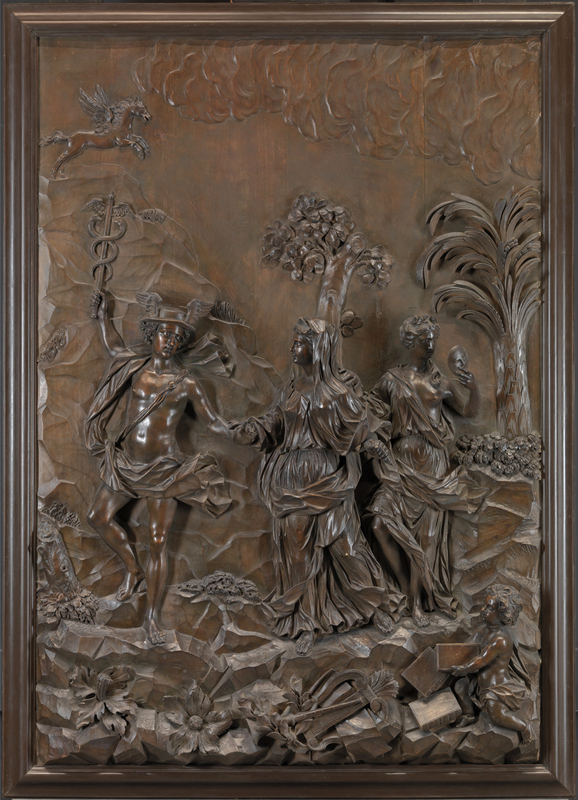 Help the Fitzwilliam Museum, Cambridge, to acquire this superb trophy frame, a work of art which will not only fill a gap in the Museum’s collection, but which has both local and national importance. Tim Knox, Director & Marlay Curator of the Fitzwilliam, describes the frame, and explains its history. Gilded limewood, mirror plate old but replaced. 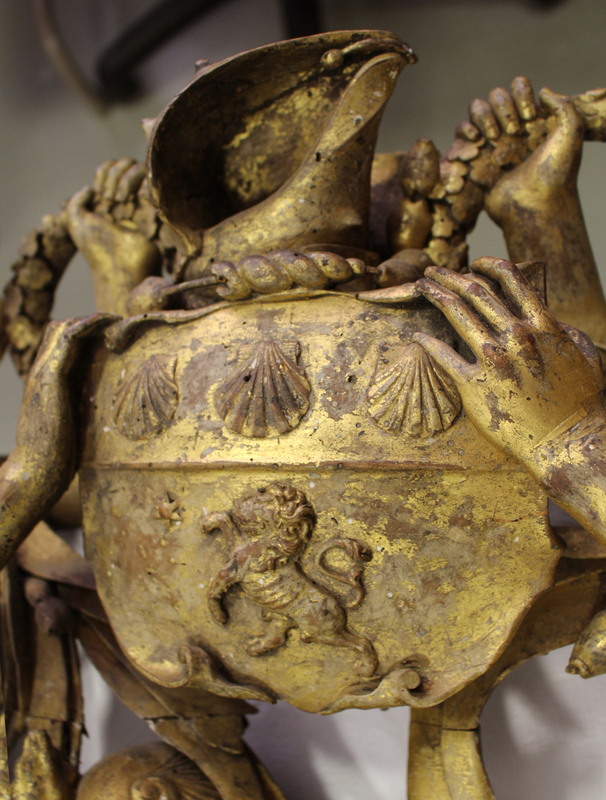 Provenance: Commissioned by Admiral Edward Russell, probably for Chippenham Park, Cambridgeshire, some time between 1692-97 (evidence from coat of arms). Probably inherited in 1727 by his great-niece, Letitia, who had married the 1st Lord Sandys in 1724. Possibly by family descent at Ombersley Court, Worcestershire (but not mentioned in Arthur Oswald’s three articles in Country Life in 1953; the family connection was also fairly remote). Collection M. Michel Dezarnaud (d. June 2016), Neuilly-sur-Seine, Paris, from whom bought by a dealer in Belgium. Currently with a New York dealer. 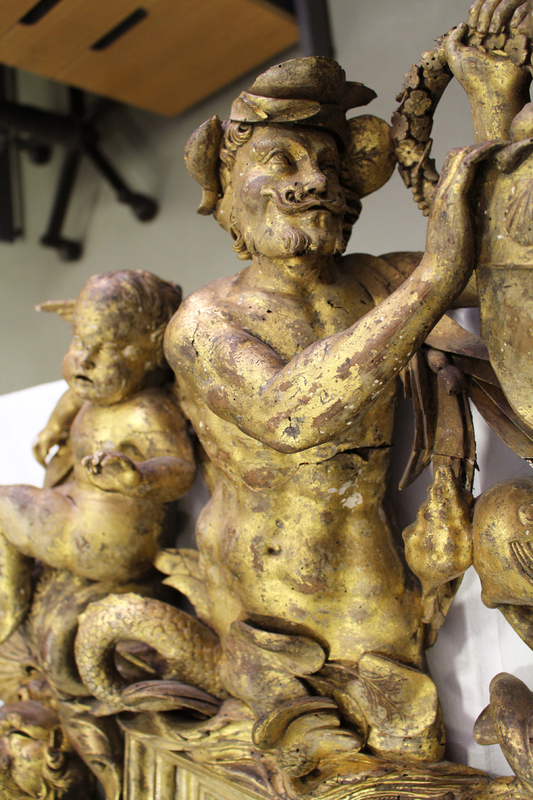 A spectacular frame of deeply carved and gilded limewood, with full-length flanking figures depicting Hercules and Mercury holding their respective attributes, perched on brackets formed of ship’s prows, flags and military equipment. 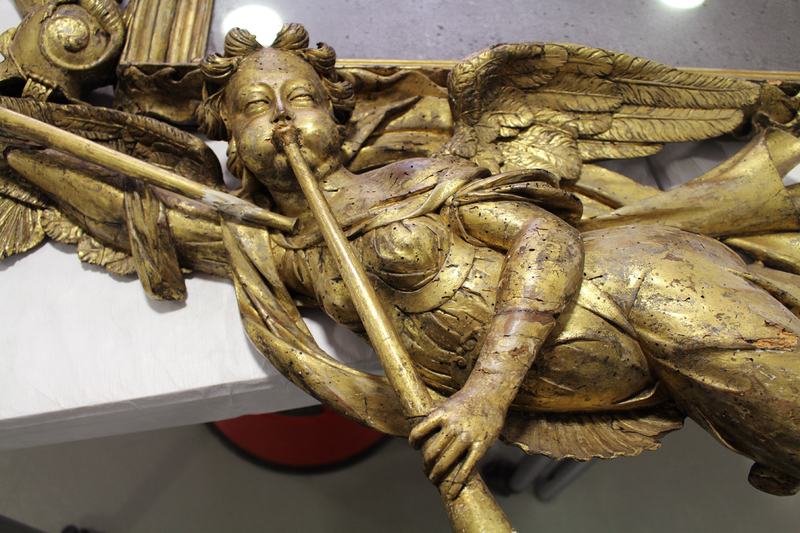 Below, a flying figure of Fame blowing two trumpets. 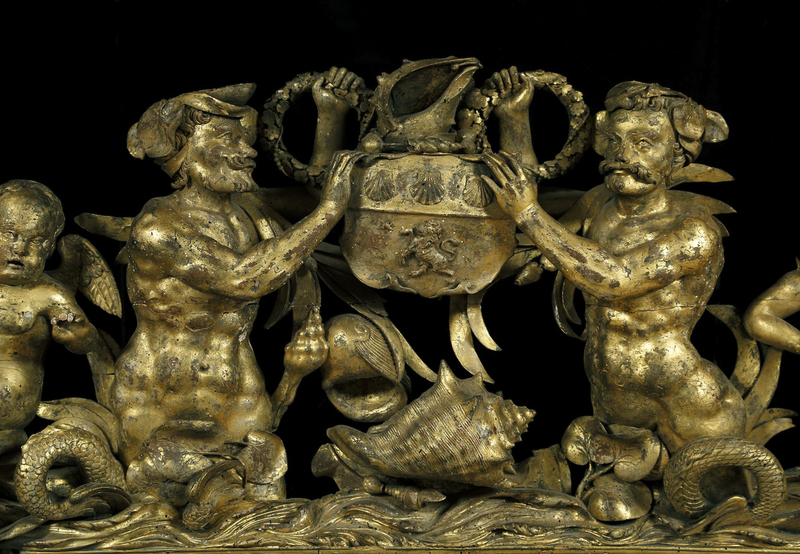 The frame is surmounted a pair of wreath-bearing Tritons holding a shield bearing the arms of Edward Russell and putti seated on overflowing vases, with marine molluscs etc. In terms of its style and iconography the frame is a highly sophisticated Baroque trophy frame of the 1690s, but with a charming naiveté in the execution of certain elements, notably the full length figures, which are themselves probably derived from Mannerist engravings. 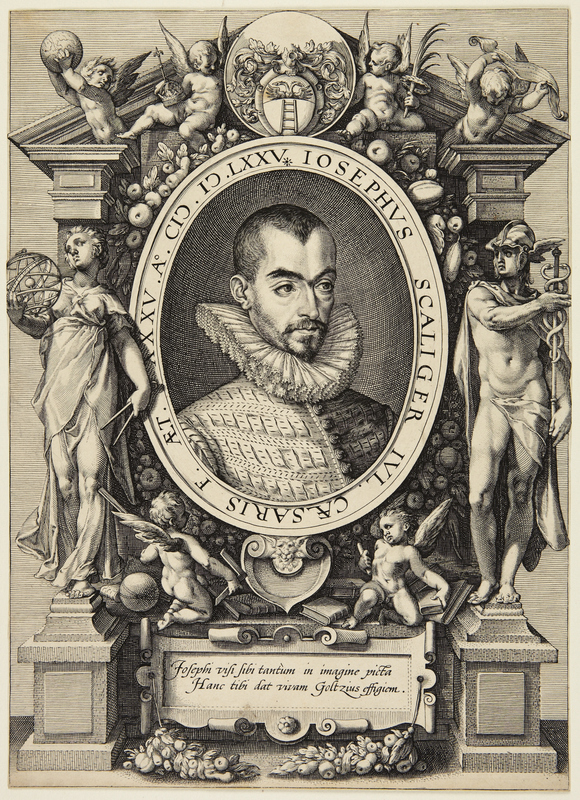 The pose of Mercury is close to a figure of that deity in a late 16th century cartouche surrounding a portrait of Josephus Justus Scaliger engraved by the Dutch printmaker Hendrik Goltzius (1558-1617) in 1592, while both have an elongated elegance reminiscent of the northern Mannerism of Bartholomeus Spranger (1546-1611). These rather old-fashioned sources contrast with the depiction of sea shells on the cresting of the frame, which is especially naturalistic and virtuoso, representing recognisable species – strombidae, neritidae etc. The mouldings representing flowing water suggest the influence of the Dutch Auricular style. The most prominent features are the two upright figures; Hercules and Mercury, an unusual pairing. The former represents heroic endeavour and physical strength, and is shown with his usual attributes, wearing the skin of the Nemean Lion and brandishing his knotted club. He holds a bunch of fruits, representing the Apples of the Hesperides, the retrieval of which was the penultimate of his twelve tasks. The apples bestowed immortality on those who ate them, suggesting further that the name of whoever’s portrait was contained in the frame (or whose face was reflected in the mirror it contained) would be everlasting. The apples are presented in the guise of pomegranates, fruits especially associated with Spain, and often referred to as an ‘Apple of Granada’, from the French ‘pomme-grenade’. According to ancient legend, the Hesperides, the nymphs who guarded the apples, were goddesses of the evening and the golden light of sunset. Consequently their garden was thought to be at the western extremity of the known world, which in the classical period was the Iberian peninsular. This may not be coincidental; in 1694/5 Russell achieved great renown defending Spain against French invasion, during which time the King of Spain himself, Carlos II, addressed the Admiral as ‘ye Protector and Deliverer of Spain’. The figure of Mercury on the right side of the frame represents commerce, trade and financial gain. In this instance, perhaps with the aim of emphasizing the point, instead of holding the more usual attribute of a single bag of money, Mercury is shown bearing several, possibly a reference to the immense fortune Russell made from his naval prizes. The two trumpets of the allegorical personification of Fame below the frame reminds us that she can speak both good and ill of her favourites. 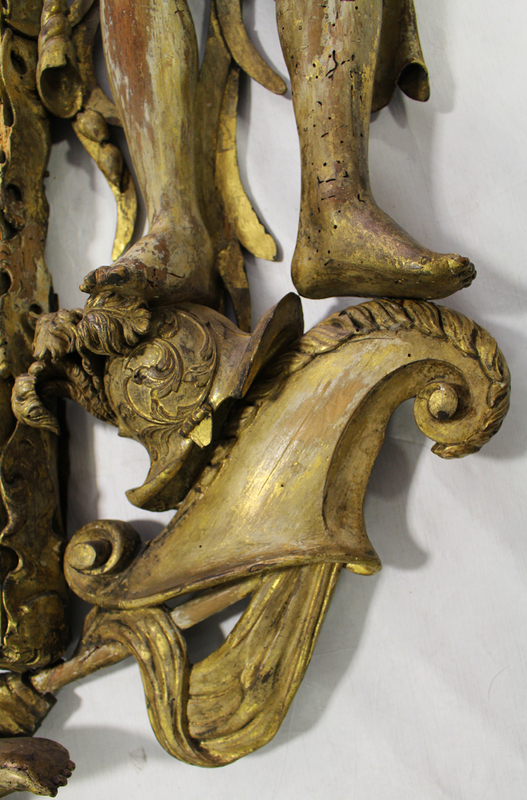 The designer and carvers of this remarkable frame are not known, but it has been suggested that they were professional artisans employed by the Royal Dockyards. This can be explained by Russell’s links with the navy, and his status as Admiral of the Fleet (1693) and First Lord of the Admiralty (1694). The navy employed a permanent staff of highly skilled woodcarvers for the decoration of ships, which reached astounding levels of quality and complexity in the 1690s. For instance, the elaborate decoration of Louis XIV’s flagship, the Soleil Royal, sunk by Russell at La Hogue, was designed by Jean Berain the Elder (1637-1711) with input from the King himself , while the stern of Charles I’s flagship The Sovereign of the Seas (1637) was decorated in an incredibly complex narrative in carved wood, designed by Sir Anthony Van Dyck and carved by the brothers John and Mathias Christmas, which traced English sea supremacy back to King Edgar. 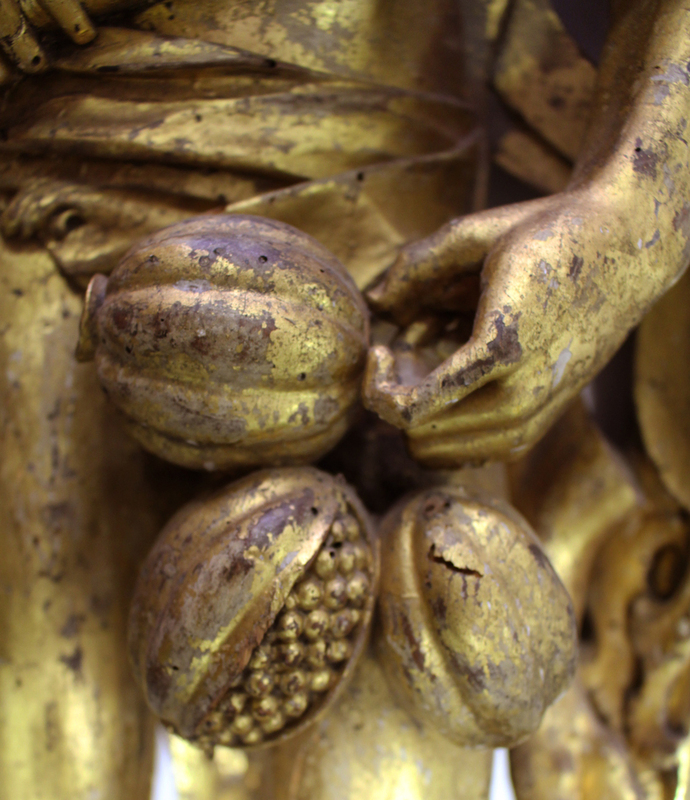 The Dockyard carvers were often Dutch or French Huguenots, and Grinling Gibbons, a Dutchman, began his career in the naval yards at Deptford. 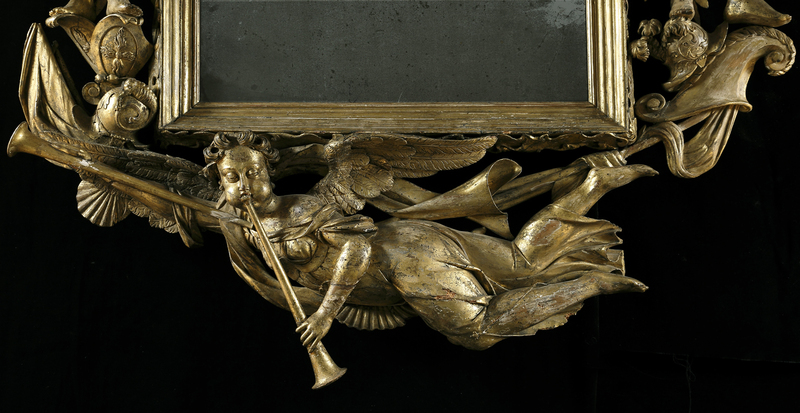 Alternatively, the frame may be the work of carvers on dry land, who satisfied the late 17th century demand for elaborate carved interiors, a taste which culminated in the unsurpassed virtuosity of the work of Grinling Gibbons. The Russell Frame is quite unlike Gibbons’s characteristic festoons and trophies of flowers, fruit, dead game and other objects, and does not approach the sophistication and refinement that he and his principal followers achieved in finely-cut limewood. Indeed, the design of the Russell Frame – with its three-dimensional figures and carefully arranged, symmetrical composition – has more in common with contemporary engraved frontispieces for books or designs for temporary triumphal arches. But there were other talented carvers at work, often confined to specific regional areas, and further research and comparison with documented commissions may identify the carver himself. 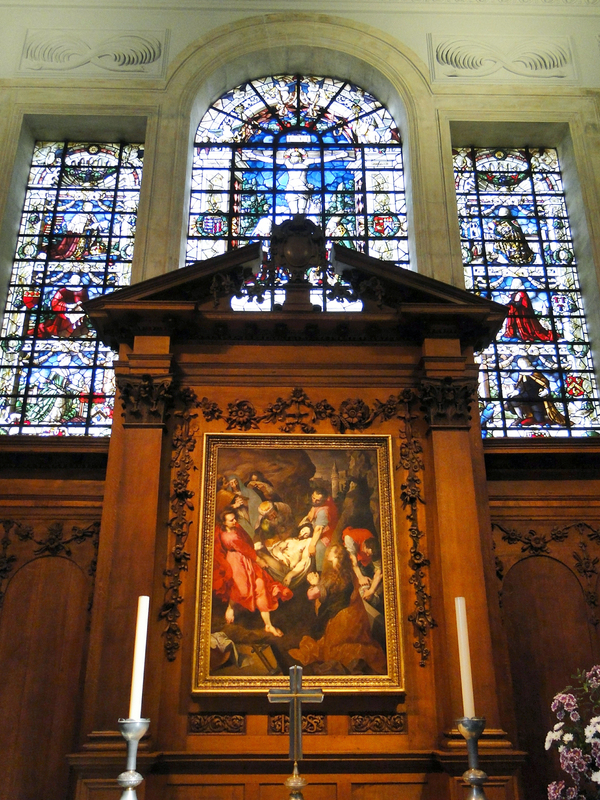 For instance, the carver Cornelius Austin, who executed the reredos and stalls at Pembroke College, Cambridge, in 1665, although these are carved from oak, rather than limewood. Then there is the unknown woodcarver who executed the so-called Stowe Reliefs, now in the Yale Centre for British Art in New Haven, but once incorporated into the overmantels of the State Dining Room at Stowe in Buckinghamshire. The doll-like figures and choppy drapery in these large, high-relief carvings are reminiscent of certain details in the frame. It may be significant that the Stowe Reliefs were probably only brought to Stowe from another architectural context in the mid-eighteenth century. There is some debate as to what the frame originally contained. The present antique mirror plate is a recent replacement, but it may have always contained an expensive looking-glass – the elaborate iconography of the frame providing a glorious setting for its famous owner’s reflection. Elaborately framed glasses are known from the period, often with a matching ‘triad’ of table and candle stands, invariably made of luxurious materials such as ebony and exotic woods, lacquer or gilded gesso. Silver sets even survive, notably the famous suite surviving at Knole, Kent. On the other hand, there is a well-established Dutch tradition of elaborate frames for portraits of naval heroes – such as the matching trophy frames surrounding the portraits of Michiel and Engel de Ruyter, and Wolfert van Brederode in The Mauritshuis at The Hague of c.1663-9 . This tradition was imitated in Britain – a late example being the frenzied Rococo frame, incorporating flags, sails and a sea god, surrounding a portrait of Admiral Byng at Wrotham Park in Hertfordshire of c.1750 – although the Russell Frame is much more sculptural and elaborate than any of these examples. Moreover, the sight size of the Russell Frame is not a standard canvas size and seems rather small for a state portrait of a celebrated hero, whereas for technical reasons looking-glasses could only be made in a relatively modest sizes. Thus, the present writer thinks it has always contained a glass – the ‘conceit’ being that Admiral Russell would have gazed at his own reflection in it, surrounded by symbols of his naval glory. The Frame bears the arms of Admiral Edward Russell, 1st Earl of Orford of the first creation (1653-1727) . 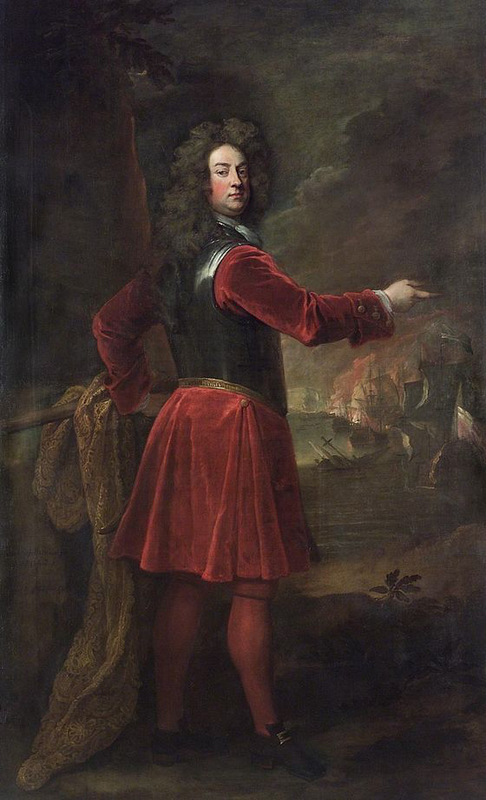 The marine equivalent of the 1st Duke of Marlborough, Russell is chiefly remembered today for his triumphs at the naval battles of Barfleur and La Hogue, on 29 May and 4 June 1692 respectively. These confrontations irreparably damaged the French Atlantic fleet and made the proposed invasion of Britain by Louis XIV and the deposed English King, James II, impossible, thereby securing the position of William III. 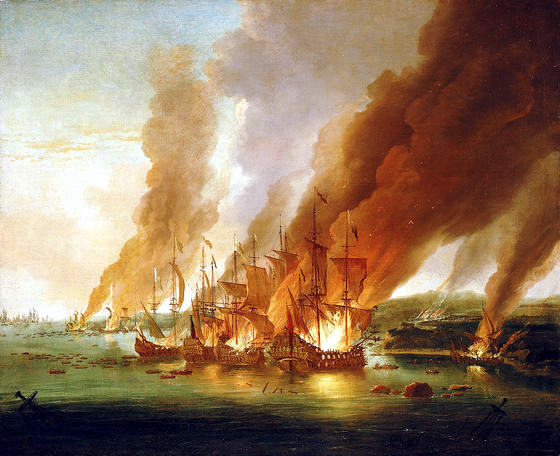 The scale of this double battle was enormous; 126 ships in total – over twice the size of the Battle of Trafalgar. It was this victory that led to Russell’s promotion to Admiral of the Fleet in November 1693, First Lord of the Admiralty in April 1694 and creation as 1st Earl of Orford in 1697. The imagery of the frame clearly celebrates Russell’s remarkable and unsurpassed naval career. Edward Russell was a sophisticated and extravagant patron of the arts. This was especially the case at his country estate, Chippenham Park in Cambridgeshire, halfway between Bury St Edmunds and Ely, for which he paid £16,250 in 1689. ‘The great curiosity of this wood carving about the doors, chimneys and sconces together with the glass panels is much talked of, and is the finest and most in quantity and numbers that’s to be seen anywhere’. The year of Fiennes’s visit, 1698, was the height of Russell’s fame and influence, and it is likely that the frame was made just before this, and may well have been seen by her. In May 1697, Russell was created Earl of Orford, after which his coat of arms would have been surmounted by a coronet. This, and its victorious iconography, encourages a date between Russell’s victories at Barfleur and La Hogue in 1692, and his elevation to the peerage in 1697. This means it must have been made for Chippenham Park, rather than Russell’s house in London, or his other seat, Orford House in Ugley, Essex, which are later projects. Apart from this magnificent frame, not much remains of the artistic patronage of Admiral Edward Russell, 1st Earl of Orford. Several portraits and views of the naval battles survive at Ombersley Court, Worcestershire, the seat of the Sandys family, descendants of Russell’s great-niece. 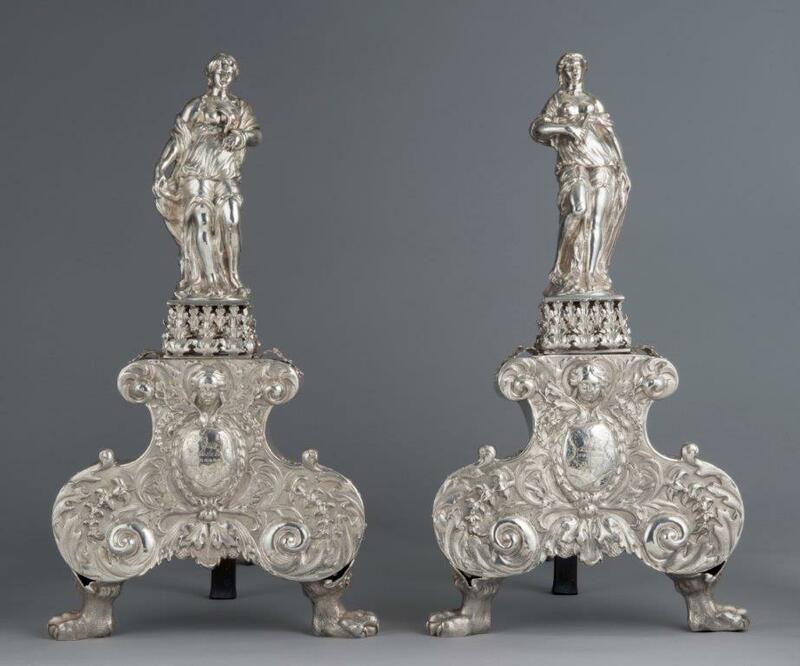 A splendid pair of silver andirons, supporting emblematic figures of Cleopatra and Lucretia, probably made by the Dutch silversmith John Moore (or Jean Henri de Moor), and hallmarked London 1680-81, have recently been acquired by Amgueddfa Cymru (National Museum of Wales, Cardiff). These also came from Ombersley Court and are engraved with the arms of Admiral Russell and his second wife, his cousin, Lady Margaret Russell, suggesting they were acquired by the Admiral between 1691 and 1697 – at almost exactly the same time as it is believed the frame was commissioned. Russell had no direct offspring, and his property was divided between his nieces and nephews. 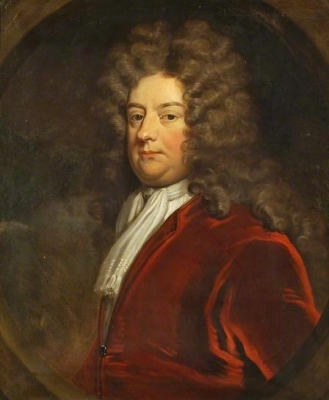 Yet Russell did leave a political legacy; his political protégé Robert Walpole (1676-1745) would become Britain’s first and longest-serving Prime Minister. It was in memory of Russell that Walpole decided to adopt the title of Earl of Orford of the second creation in 1742. As the flagship museum of the University of Cambridge, the Fitzwilliam Museum takes teaching and research very seriously, sharing its collections and in-house expertise with academics, visiting scholars, and students from both within the University and beyond, as well as with local schools and community groups. Moreover, we are also a popular public art museum, welcoming over 400,000 visitors every year from across the globe. 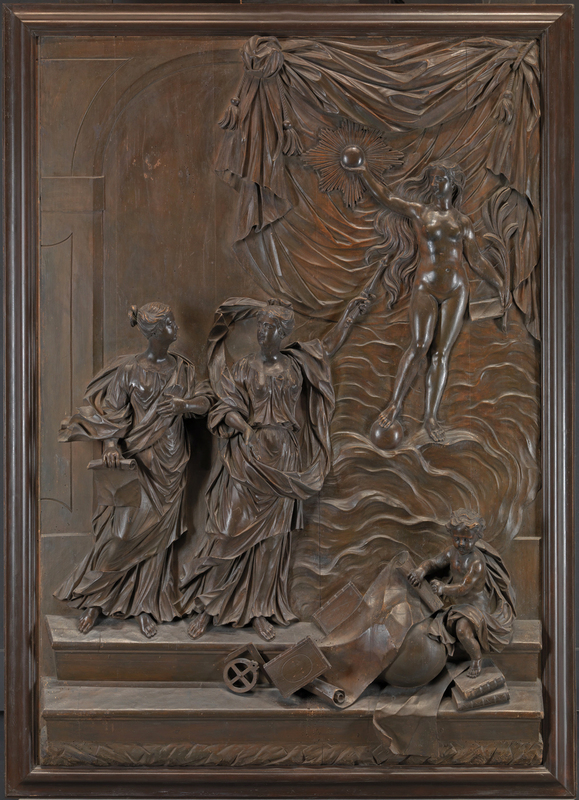 The Russell Frame warrants additional scholarly research to identify the designer and carver/s, and pin down the sources that inspired its complex iconography. If acquired, the Frame would be included in the forthcoming Fitzwilliam Museum Catalogue of Sculpture as well as the Your Art national inventory of sculpture in public collections in Britain. The iconography of the frame could stimulate a wide range of themes for teaching sessions for both adults and children, such as deciphering its iconography with reference to other works of art in the Museum, looking at different styles of historical frame, or workshops where people create their own ‘autobiographical’ frames. As an object of local interest – Chippenham Park is only 25 miles from Cambridge – the Russell Frame will arouse great curiosity, and indeed we hope to find out more about this lost great house. More work should also be done on the patronage of Admiral Russell, possibly in partnership with Amgueddfa Cymru (National Museum of Wales), who have just acquired the Russell Andirons. The acquisition of the frame is the Bicentenary project of the Friends of the Fitzwilliam Museum, a staunch supporter group that was founded in 1909 and was the first Friends organisation in any British museum. Finally, the acquisition of the Russell Frame is one a series of major acquisitions with which the Museum hopes to mark the 200th anniversary of its foundation. 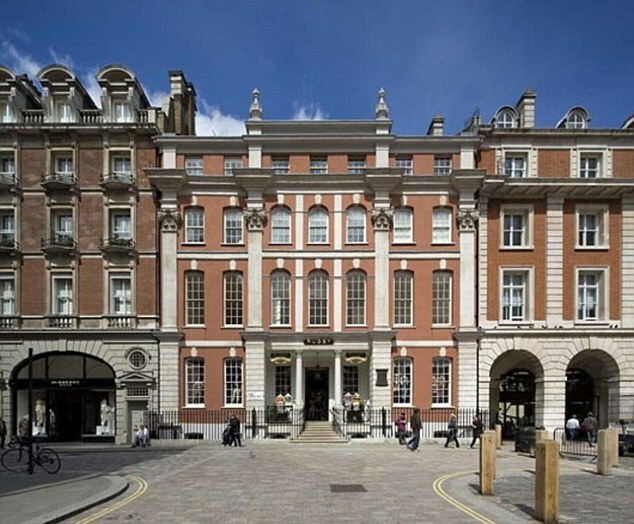 The Museum regularly lends to exhibitions, both in Britain and abroad. The Russell Frame fits in with the Museum’s collecting policy which was last updated and approved by the Fitzwilliam Museum Museum Syndicate in 2015. The Russell Frame is at the same time a work of sculpture and a lavish example of parade furniture. The Fitzwilliam Museum has an important collection of sculpture, which ranges from ancient Egyptian masterpieces such as the granite sarcophagus lid of Rameses III, through Greek, Roman and Cypriot sculpture, to European sculpture from medieval times to the present day. 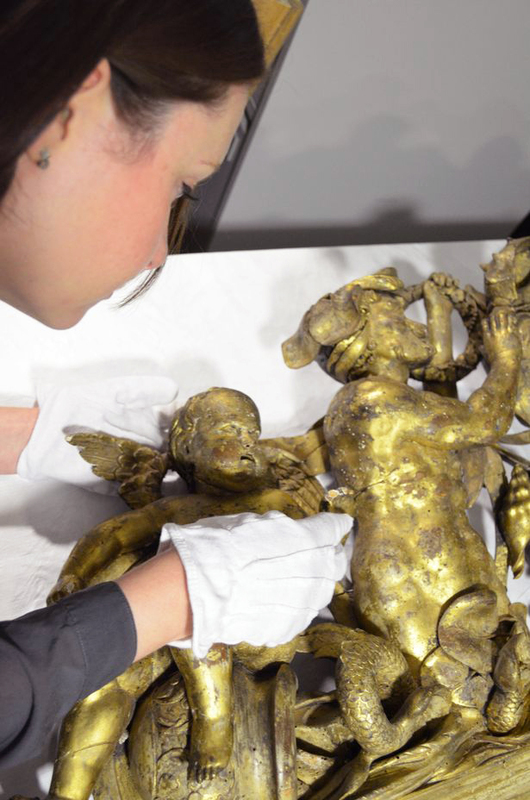 Notable strengths include Italian Renaissance bronzes, English and French 18th century terracottas, three original wax sculptures by Edgar Degas, and important works by Giacometti, Moore, and Hepworth. There is also an interesting collection of European Medieval and Renaissance polychrome wood sculpture, which will be the subject of a forthcoming research project, and Pedro de Mena’s mesmerising Virgin of Sorrows of 1675, acquired in 2014. A showy Baroque terracotta bust of Charles II attributed to John Bushnell, a statue of Glory by Giovanni Baratta commissioned in c.1715 by the 1st Duke of Marlborough and one of the finest collections of Delft (British, Dutch and Irish) in any British museum, provide additional context for the Russell Frame. The frame will also complement the collection of furniture in the Fitzwilliam Museum, notably an impressive group of long-case clocks, a 17th century French floral marquetry cabinet attributed to Pierre Gôle, and the Byng Cabinet, an important work by Andre-Charles Boulle. This last was allocated in lieu of inheritance tax to the Fitzwilliam Museum in 2010. In 2015 the Museum purchased a documented Augsburg cabinet, of about 1630 by Elias Boscher, inset with Florentine pietre dure plaques depicting birds and flowers. This has recently been joined by the celebrated Castle Howard cabinets, a spectacular pair of 17th century Roman cabinets set with hardstones, acquired this year to mark the bicentenary of the founding of the Museum. Thus, including also the Roman Baroque console table from Mentmore Towers, a magnificent ‘archaeological’ commode by Pierre Langlois, possibly designed by Sir William Chambers, and a George Bullock cabinet made for the 4th Duke of Atholl, the Fitzwilliam Museum can boast a significant collection of furniture, which complements our holdings of paintings, sculpture and decorative art. The displays, which continue a tradition begun by former Director, Sir Sidney Cockerell, in the 1920s, combine paintings, sculpture, furniture, carpets and the decorative arts in almost domestic juxtapositions, which is much appreciated by our visitors. The Museum also has an interesting collection of picture frames – an area which is exciting a surge of interest. These encompass good examples of frames from the 14th to the late 20th centuries. In our current display of volumes of engravings collected by the Museum’s Founder, Richard, 7th Viscount Fitzwilliam of Merrion is an album entitled ‘Book of Mirrors, Tables and Gueridons…’, with a selection of elaborate frame designs by Jean LePautre (1618-82). But the Museum lacks an actual, spectacular Baroque trophy frame, a deficiency that the Russell Frame would definitely remedy! Please contribute whatever you can to help the Museum acquire this spectacular work of art. It has until 31st December 2016 to raise the money needed; 80% of the cost has already been given from various sources, and only a further £70,000 of the £345,000 needs to be found. You can make a difference – and have a stake in a unique work of art. The banner below will take you to the Museum’s donation page – thank you!